To Cite: Rasouly N, Stanekzai R, Hamidi H, Ahamdzai R. Computed Tomography Features of Left Ventricular Pseudoaneurysm: A Case Report, Iran J Radiol. 2017 ; 14(2):e41925. doi: 10.5812/iranjradiol.41925. Left ventricular pseudoaneurysm is a rare and fatal complication of myocardial infarction. Patients usually die from hemorrhage; therefore, urgent surgical resection is the mainstay of treatment. The most important differential diagnosis for this entity is left ventricular true aneurysm that could be managed with medical treatment. The diagnostic work up of left ventricular abnormal outpouching is well illustrated in the literature; however, less is written about the role of computed tomography angiography (CTA). Hereby, we present a case of left ventricular pseudoaneurysm in a 65-year-old woman who suffered from an ST elevation myocardial infraction six months ago. The echocardiography and chest CTA examinations revealed formation of a large aneurysmal cavity posterolateral to the left ventricle with significant thrombus formation. However, less is written about the role of computed tomography angiography in the diagnostic work up of left ventricular pseudoaneurysm. We present the typical features of left ventricular pseudoaneurysm depicted with CTA. The left ventricular wall can suffer from abnormalities in post myocardial infarction (MI). It can become thin resulting in the formation of abnormal aneurysmal cavity (true aneurysm) or it may even rupture. In cases of post MI left ventricular true aneurysm (LVTA) the infarcted myocardium is thinned and demonstrates fibrous elements (1). Left ventricular wall rupture is a terrible complication that occurs in 4% of post MI patients and in 23% of patients who die from MI (2). Rarely, the rupture can be limited by pre-existing adhesions between the epicardium and pericardium forming a cavity, the so called left ventricular pseudo aneurysm (LVPA) (3). The main cause of LVPA is MI; however, other less common causes are also cardiac surgery, chest trauma, inflammation, and infection (3). A rare group of LVPAs is related to pre-existing structural myocardial defect (4). A 65-year-old woman suffered an ST-elevation myocardial infraction six months ago and received fibrinolytic therapy thereafter. She developed chest pain and shortness of breath for the last three months that worsened with ordinal activity. The patient looked well in physical examination. Pulse rate and blood pressure were normal. On auscultation, basal crepitation was audible on both sides and grade III systolic murmur was heard on the cardiac apex. Electrocardiogram (ECG) showed Q wave in inferior leads within sinus rhythm. Echocardiography demonstrated segmental wall motion abnormality in the left ventricle. The posterolateral cardiac wall was akinetic. Left ventricle ejection fraction was 40%. A large abnormal cavity was visualized communicating with the posterior wall of the left ventricle (Figure 1A). Massive cloths were seen in the posterior aspect of this abnormal cavity (Figure 1A). Color Doppler showed bidirectional flow between this abnormal cavity and left ventricular lumen (Figure 1B). Cardiac valves were structurally normal; however, mild regurgitation of mitral and tricuspid valves was observed. Figure 1. Transthoracic echocardiography of a 65-year-old woman complaining of chest pain and shortness of breath. A, plax view, large aneurysmal cavity attached to the posterior wall of the left ventricle (LV) with direct communication with the left ventricular lumen. Massive clots are seen in the posterior aspect of this abnormal cavity (arrows); B, Color Doppler shows bidirectional flow between ventricular lumen and this abnormal aneurysmal cavity (AC). Plain chest radiography showed nonspecific enlargement of the cardiac shadow mainly at the ventricular level. Calcification of the aortic arch was also noted (Figure 2). Figure 2. Postero-anterior radiograph of the same patient. Nonspecific enlargement of the cardiac shadow mainly at the ventricular level (evident by elevated left heart border). Calcification of the aortic arch is also noted. Based on the echocardiography and plain radiography findings, the patient underwent chest CTA with 128-slice Siemens scanner. The CTA images revealed an abnormal cavity opacified posterolateral to the enlarged left ventricle connecting with the left ventricular lumen via a wide neck (Figure 3A and 3B). This large, abnormal cavity was localized in the lateral aspect of the diaphragmatic region (Figure 3A). The maximum diameter of the aneurysmal cavity was approximately twice larger than its neck (Figure 3A and 3B). The maximum diameter of the cavity was 74 mm in comparison to 36 mm transverse diameter of its neck (Figure 3B). Abnormal, discontinuous, nodular calcifications are seen in the walls of this abnormally formed cavity on pre contrast images (Figure 3C). Soft tissue density, non-enhancing area was observed between the partially calcified wall and contrast opacified lumen of this cavity representing extensive thrombus formation (Figure 3D). Figure 3. 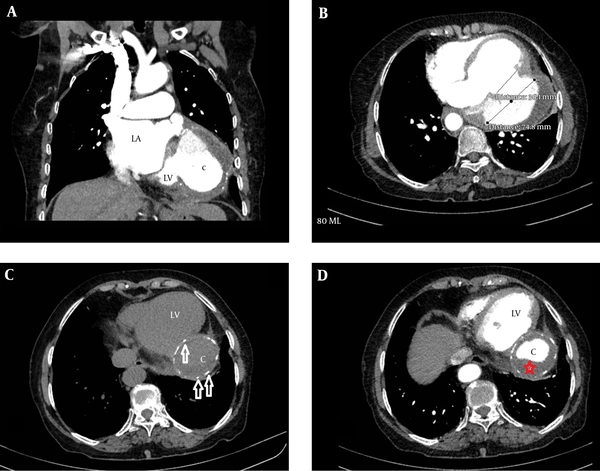 A, Contrast enhanced CT, coronal section at the level of the left atrium (LA) and posterior aspect of the left ventricle (LV) shows a large abnormal opacified cavity (C) connected with the left ventricle and localized on the lateral aspect of the left hemi-diaphragm; B, Contrast enhanced CT, axial section at the level of the neck of the aneurysmal cavity. The maximum diameter of the cavity is about twice larger than its neck. The maximum diameter of the cavity is 74 mm in comparison to 36 mm transverse diameter of its neck; C, Non-enhanced axial CT section at the level of aneurysmal cavity shows discontinuous, nodular calcifications (arrows) in the walls of the abnormally formed cavity (C); D, Contrast enhanced axial image at the same level shows soft tissue density, non-enhancing area (red asterisk) between the partially calcified wall and contrast opacified lumen of the cavity representing extensive thrombus formation. Multi planner reformatted (MPR) and volume rendering technique (VRT) images showed difference in the intensity of contrast in the cardiac chambers and this abnormally formed cavity representing turbulent flow at the cavity (Figure 4A - 4D). Coronary arteries could not be traced over the wall of this cavity with non-ECG gated CTA. Figure 4. Reformatted volume rendering technique (VRT) (A, B) and multi planar reformatted (MPR) (C, D) images show difference in the intensity of contrast in the cardiac chamber- left ventricle (black asterisk) and the aneurysmal cavity (black arrow) represents turbulent flow in the cavity. 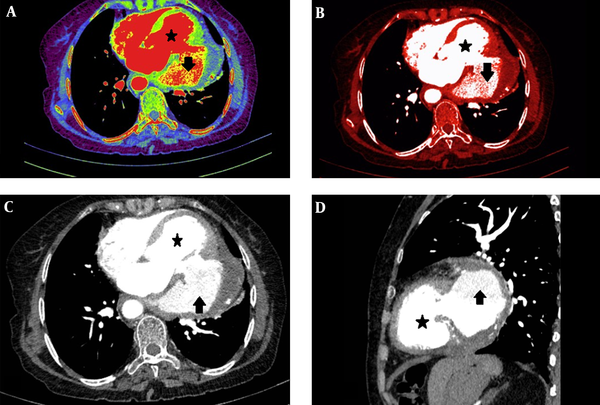 The diagnosis of left LVPA was made based on clinical and imaging findings. The patient refused surgical treatment and was lost to follow-up. Written consent was obtained from the patient for publication of this case report and accompanying images. Differentiation between LVTA and LVPA however difficult, is the most important question to answer as their treatment options are totally different (2). LVTA can be treated by means of elective surgery (2) or even medical treatment, while LVPA needs urgent surgical intervention (1). - Size of the neck: LVTA has a wide neck that is the largest part of the aneurysm while the neck of LVPA is narrower (3). In an echocardiographic study, Gatewood and Nanda showed that the ratio of maximum neck diameter to the maximum internal cavity diameter of LVPA was 0.25 to 0.5 and for LVTA it was 0.9 to 1.0 (5). - Presence of remnants of the myocardium: LVTA contains myocardial remnants in its wall while LVPA does not (3). - Presence of coronary arteries: LVTA is covered by myocardial layers so coronary arteries can be traced in its wall, LVPA has avascular covering and no vessel can be seen in its wall (6). - Location: LVPAs are located mainly in the inferolateral location, while LVTAs are more often apical or anterolateral (1, 2). Autopsy series however showed that the location is not a useful landmark for differentiating LVTA from LVPA (1). Another differential diagnosis for left ventricular outpouching is ventricular diverticulum. Left ventricular diverticulum (LVD) is a congenital entity that contains endocardium, myocardium, and pericardium and in its wall and shows normal contraction (7). LVD is very rarely seen in adults and is commonly located in the apex (8). A narrow mouth and synchronous contractility are characteristic for LVD (9). Distinction between LVPA and LVTA is very difficult clinically, as they share many characteristics (2). Many patients with LVPA are asymptomatic and diagnosed incidentally (2). Some patients may present with chest pain, hypotension and dyspnea while others may have pericardial friction rub, decreased heart sound, sinus bradycardia and junctional rhythm (6). Persistent ST elevation of infarcted areas is an ECG sign (2). Important to say is that all of these signs and symptoms are also characteristic of LVTA (1). 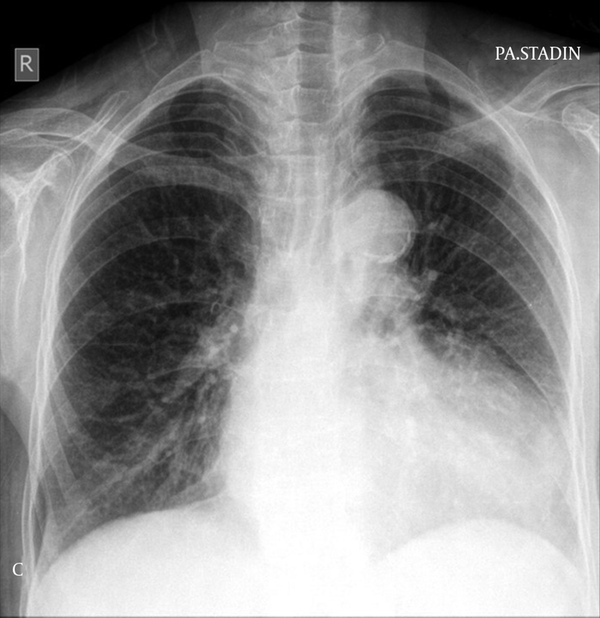 Patients with LVPA rarely have a normal chest radiograph (3). Whenever a discrete bulge in an atypical location of the cardiac shadow is noted, the possibility of LVPA could rise (1). Rapid increase in size, peculiar shape or formation of daughter aneurysms could further increase the suspicion (3). The most important and difficult finding on echocardiography is the detection of continuity of the myocardium (2). Presence of turbulent flow at the cavity or its neck suggests presence of a pseudoaneurysm (10). Magnetic Resonance (MR) Imaging: MR imaging has the ability to depict the entire heart and clearly distinguish between pericardium, thrombus, myocardium, and epicardial fat. A characteristic feature of pseudoaneurysm on MR imaging is marked delayed enhancement of the pericardium; however, in some cases, differentiation of delayed myocardial enhancement from an adjacent pericardium may be challenging (11). Cardiac Catheterization: Cardiac catheterization can clearly depict the location and anatomy of the aneurysm, situation of coronary arteries (3), degree of mitral regurgitation, as well as extent of pulmonary hypertension (2). Arteriography is important to delineate coronary arteries over the abnormal cavity walls in order to differentiate LVTA versus LVPA (2). Contrast can remain in the abnormal cavity for several beats after injection consistent with the stagnant flow of blood in the sac (1). The disadvantage of catheterization is its invasive nature and the risk of dislodging a potential thrombus (11). Less is written about the role of CTA in the detection of this entity. Some authors argue that CTA is of limited role and suggest that due to less availability and higher cost, it should not be considered as the first line imaging method (12). However, we do not agree with this comment. As in our case, CTA can well depict many of the diagnostic features of LVPA and the issue of cost and availability is better for CTA than MR imaging. Despite all the mentioned points, sometimes the imaging features could be quite similar, and accurate differentiation between these two entities could be challenging with various available imaging modalities (1). Therefore, surgical assessment and pathological evaluation may be imperative for definitive diagnosis (13). LVPA has a high risk of rupture even after years, while a LVTA may give rupture in the early clinical course, but late rupture is extremely rare (3). In the absence of other indications for surgery, LVTA is treated medically, but as patients with LVPA most commonly die of hemorrhage (3), urgent surgical resection is the treatment option of choice for LVPA. Ethical approval: The article has got approval of exemption from the ethical review committee of French Medical institute for Children, as case reports are exempted from ethical review as per to institute policy. Thanks to Basir Ahmad Shahin, senior CT radiographer at radiology department of FMIC for providing the CT images. Conflict of Interests: No competing interest exists. Funding/Support: No financial support exists.